All India Ulama Mashaikh Board has constantly been educating both the masses and the rulers about the impending dangers to the social fabric and national security of the country by the hands of an ideology led and fed by Gulf oil money. 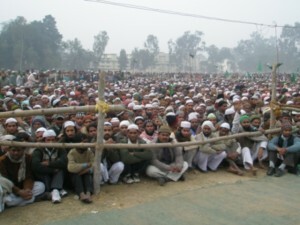 Moradabad Sunni Conference was a land mark in this tirade which saw a very big crowd in heartland of Uttar Pradesh coming to register their presence in favor of the demands put forward by All India Ulama Mashaikh Board , an apex body of Sunni Sufi Muslims and has been striving to make the government, political class, administration and bureaucracy realize that after independence the representation has been hijacked by Wahhabis who are hardly 13 p.c in Indian Muslim Population , hence they are not entitled to man and manage Sufi Muslim affairs. 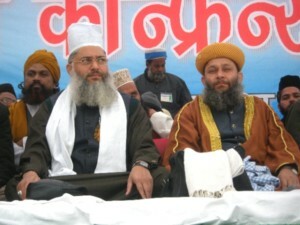 This important sunni conference was attended by several lack Sufi Sunni muslims and was addressed by renowned sufi clerics and Mashaikh such as Mufti Attub, Maulana Mohammad Ahmad Naimee, Hazrat Hashim Ashrafi Kanpuri,Syed Mahmood Ashraf [ the then president of AIUMB]Hazrat Syed Zafar Mahmood, Hazrat Allama Tauqeer Raza sb Bareli, Ashrafe Millat Syed Mohammad Ashraf. Hazrat Maulana Sted Mohammad Ashraf [then General Secretary] said that it is true that Sufi Muslims ie, followers of Ahle Sunnat Wal Jamaet are 80 percent in Muslim population of India and Wahhabis have managed to grow up to 13p.c. Being in such a micro minority they have succeeded in grabbing Muslim representation everywhere. This conference wants to make it clear before the centre and the state that they have been misguided in believing that Indian Muslims are diversified in two ideologies Sunni and Sunni, the truth must be recorded that there is another third ideology Wahhabism. Wahhabis approach the state and central governments as Sunnis and we have nothing to do with them. They do not represent us. Even this denial is not new. We go back in the past to see Maulana Fazl al Haque Khairabadi to declare that Wahhabis donot represent Sunnis. When the government of the day failed to give credence to yhis demand Bareilly took lead in making the announcement that Wahhabis are not representatives of Sunnis. 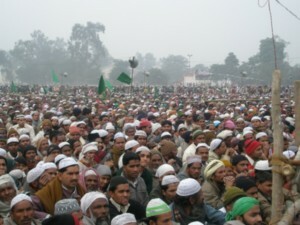 And the whole lot of Sunnis came to lend their support to Imam Ahmad Raza Khan of Bareilly. Imam Ahmad Raza Khan said that we do not accept Wahhabis in leading our prayers. Here comes the point to be noted by state and central regimes that if Sunni muslin refuses to attend prayers led by a Wahhabi, how can he support a Wahhabi in any other affair. 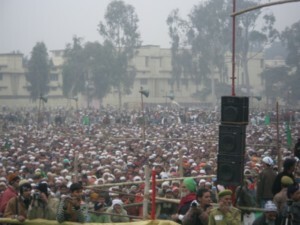 Hazrat Maulana Syed Mohammad Ashraf was supported by several lack Muslims in this conference. And there he coined the most powerful slogan of the Board “Wahhabion ki Na Imamat Qabool hai Na Qayadat qabool hai”. The other speakers including Mashaikh and clerics also spoke on the same theme. Mufti Ayyub of Moradabad Quoted from Quran and Hadith to bring his point home that Islam is a religion of peace and it insists on mercy to all. 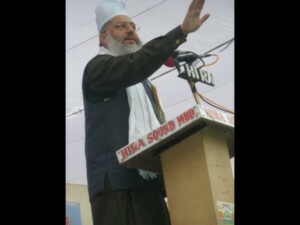 Maulana Mohammad Ahmad Naimee said that holy book Quran forbids needless bloodshed. Saying a life is equaled with saving humanity. He insisted on practicing humanity, mercy and love. 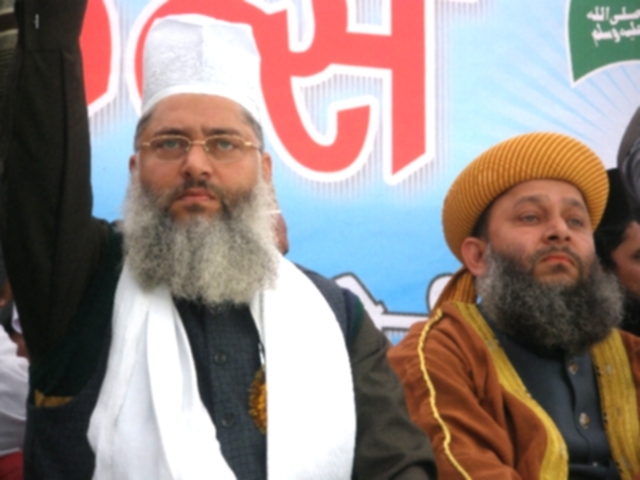 Maulana Hashim Ashrafi Kanpuri referred to the severe cold of the day and said that the intensity of the weather also could not stop these lackhs of people to reach here on the call of AIUMB. He said that it has been established that Sunni Sufi Muslims are 80 pc in Indian Muslims population and through this it gets established that mosques, Eid Gahs , Tombs, monuments and historical sites all are at least 80 pc our assets. This conference is attended by Sunnis of Madhya Pradesh, Tamil Nadu, Karnataka, Himachal Pradesh, Haryana, Kashmir, Uttra Khand, Chattis Gadh, Delhi and Maharashtra besides UP. They have all come with local complaints to say that their mosques and even Mazarat have been grabbed by Wahhabis though they do not believe in reverence and veneration. This mosque and monuments grabbing exercise is being denounced here. He named Hajj Committees and Waqf Boards where Sunni representation has been hijacked by Wahhabis. He also discussed unemployment, lack of education facilities growth of terror. He said no terrorist can be adherent of Islam. He said to stop terror from taking route in Indian Muslim society it is essential to attach them with Khanqahs, Aastanas and Dargahs. This conference also placed a demand to declare 6th Rajab al Morajjab a holiday to pay respect to Khawaja Gharib Nawaz. Next came Syed Mahmood Ashraf, [the then president of AIUMB] thanked the gathering for this great show. He said we are not against anyone. We just want to secure our just rights .He dwelt upon the services of Sufi clerics in freedom movement and said that all those clerics, Mashaikh, teachers, intellectuals went back to their area of service to serve humanity after independence and the Wahhabis came into action to grab muslin bodies and other institution by faking our representation. They are only 13 pc in Indian Muslim population but are in a position to decide on our behalf. The Wahhabis took control of all Muslim affairs and thus led the community in this bad shape which has been described in Sachchar report as worse than Dalits. Everywhere in Hajj Committee or Minority Commission, Urdu Academy or Maulana Azad Education Foundation our representation is nil. 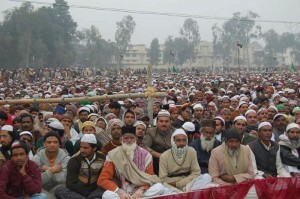 He demanded the management of Sunni Waqf Boards be handed over to Sunni Sufi Muslims the true successors of the elders. He also insisted on peace and Mercy.